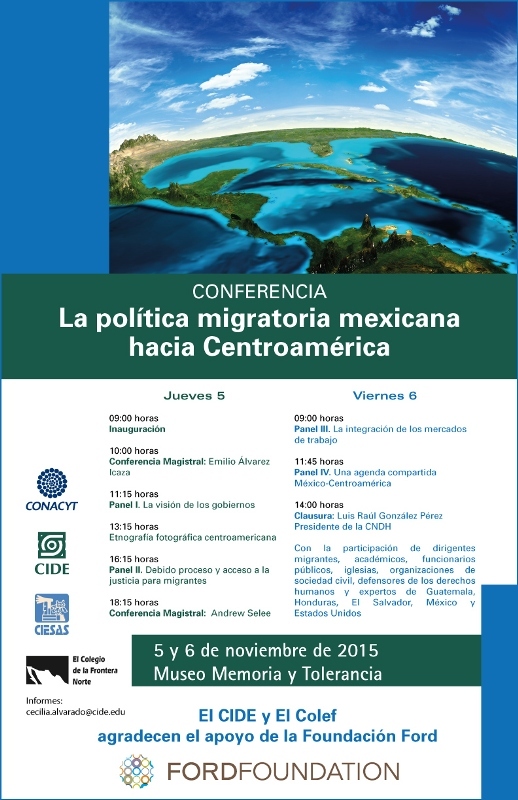 CANAMID at “Mexico's migration policy toward Central America"
CANAMID will attend the 5th and 6th of November in the international conference "Mexico's migration policy toward Central America," organized by CIDE, COLEF and CIESAS. Agustin Escobar and Pablo Mateos, directors CANAMID project, will participate as well as our partners Ursula Roldán and Fernando Valdez from the Rafael Landivar University in Guatemala. This conference will be an opportunity to present the Policy Briefs published by the project to all participants, among them migrant leaders, academics, government officials, churches, civil society, human rights defenders and experts from Guatemala, Honduras, El Salvador, Mexico and the United States.